Not long ago, generally, installing a shower and bathtub in the same bathroom was intended for large bathrooms, with enough meters to install the two options comfortably and generously. Nowadays, thanks to the new solutions of bathroom screens , shower trays, bathtubs, and other elements, small bathrooms can also house these two bathroom systems, as we will see below, with these 8 different options to install a shower and a bathtub in a small bathroom . Come with me and take advantage of meters. Initially, the simplest and most economical option, is to install a glass partition in the bathtub, to convert it into a 2 in 1. Also, if the bathroom space allows it, we can install a screen with movable system, for gain comfort when entering or leaving the shower. Another option to have shower and bathtub in the bathroom, is the one that we see above these lines. It is about using the same hole in the bathtub, to adhere an extra space, creating a space to install the shower. Through the pavement and the shower screen itself, we will separate the two areas of the bathroom. Installing a transparent glass screen in the shower, we will not break the visual continuity of the bathroom, maintaining a light aesthetic, suitable for small bathrooms. Although a built-in bath takes better advantage of the space, it is also true that it recharges more. An exempt bathtub is lighter and has much more style. It is about sacrificing some space for a lighter and more modern aesthetic, for a contemporary bathroom. If in one of the two longest walls of the bathroom, assuming that we have a rectangular bathroom, we can install the toilet and the rest of bathroom furniture , we have another wall to install the two bathroom systems.In this sense there are many options available depending on the gap we have. Above we see one of them: Bathtub in the corner, and the rest of the space, closed with a transparent glass screen to install the shower. It has even taken advantage of the hole where the tub feeding pipe is hidden to create a practical and comfortable seat in the shower. Although suppose a small extra expense, in these cases it is advisable to hire an interior designer to optimize the space of the bathroom. If space allows us, the most practical option is to separate the two systems, shower and bathtub, completely, since we can use one without staining water, soap and other elements the other. In this sense, the way in which more meters are saved is installing the two systems together on a wall, regardless of the design of both. Not all bathrooms admit the shower and the bathtub on a wall in a continuous and straight way. In this case, the solution is to move the bathtub perpendicular to the shower, taking advantage of the corner. We can do it as we see above these lines, if we have enough space, or, still reduce the angle more. To save maximum space, we have been in which the two systems should be together, but in many cases the width of the wall will not give us enough space to install the two systems continuously. In this case, we have the option of installing the bathtubs completely perpendicular to the shower, creating an L-shaped system, taking advantage of the corner of the wall, and leaving space for the rest of the elements that make up the bathroom. If the width of the bathroom does not allow us to install the shower and the bathtub parallel to the wall, we can always install them perpendicularly, if the length of the bathroom allows installing the bathtub in this way, without compromising the space of the rest of the elements. 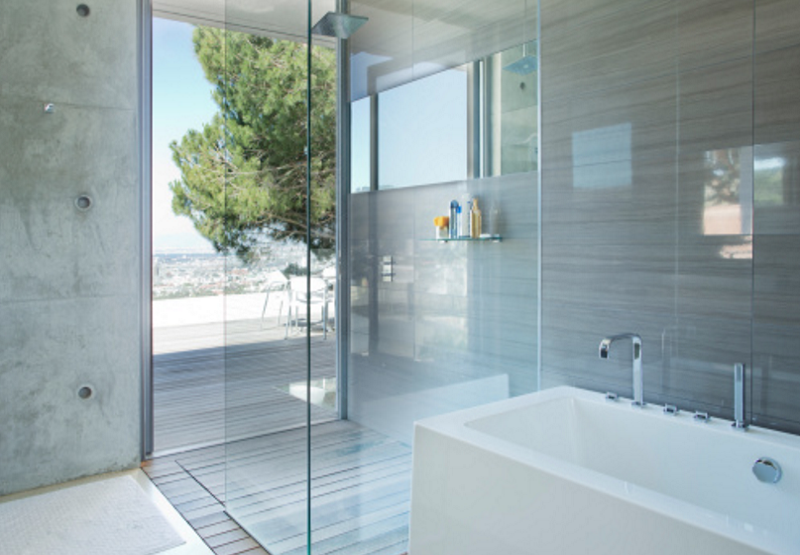 In this case, the shower screen separates the two areas of the bathroom, the bathroom and the toilet, without breaking the visual continuity. Naturally, in a large bathroom we would have more options, but, as we have seen, we do not have to give up any of the bathroom systems, even if we do not have a palace-style bathroom. This first option shows a small bathroom. As you can see, having a small bathroom is not incompatible with a shower of considerable size. The key is to sacrifice the size of the rest of the furniture to have more space to be able to allocate to the placement of the shower. In the bathroom of the image has opted for a sink and a toilet modern and minimalist style. The sink is as small as possible and its accessories are hanging on the wall to save space. In the same way, the radiator occupies a very small space when hanging on the wall. In the shower you have chosen to mix two types of tiles to give continuity to the floor and create the feeling that the bathroom is larger. Another smart idea are the holes that we can see at the bottom of the shower. Placing gel, shampoo and other objects there, we get the most out of the shower. This option is suitable whatever the size of our bathroom. Its characteristic is that both the shower and the sink and the shelf are made of work. It is an original idea since it is not common for bathrooms to have no furniture. The key to not being a dull bath is to combine different types of tiles because if we choose the same, the bathroom will have a monochromatic aspect. In the bathroom shown in the picture they have played with both the color of the tile and the texture and size. This creates a differentiation between different objects and gives a greater prominence to the shower. 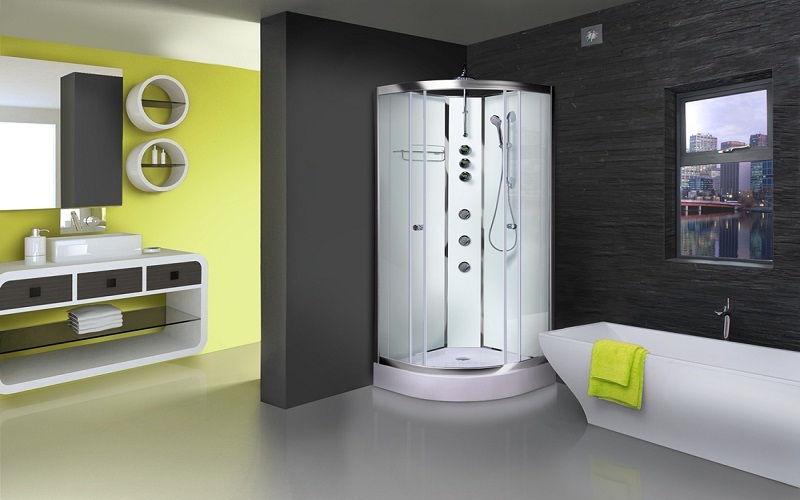 The main advantage of this type of showers is that they have a very long life because they are very resistant. If the size of the room is not a problem we have more options available and more freedom when choosing both materials and furniture. 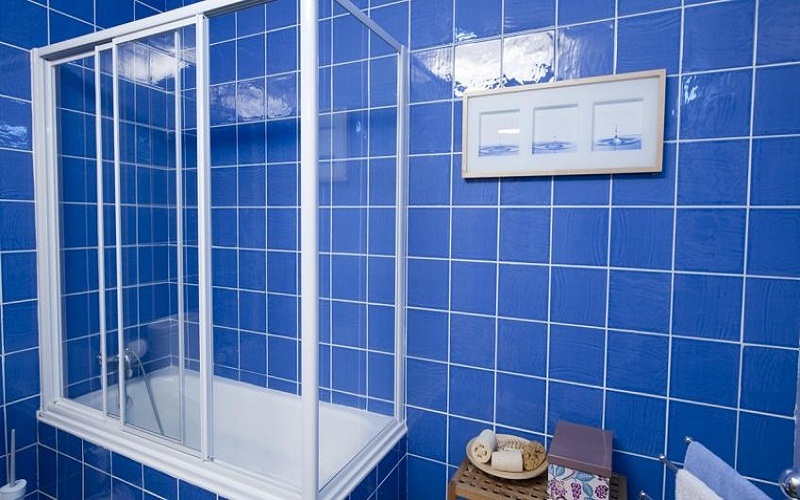 As you can see in the picture, the shower can have different areas and install a shower or jet column. These accessories are not like a hydro massage shower but they resemble a lot, occupy less space and are more economical. Another option that this bathroom shows us is the original lighting in the ceiling of the shower. This luminous square makes the shower the protagonist of the bathroom. 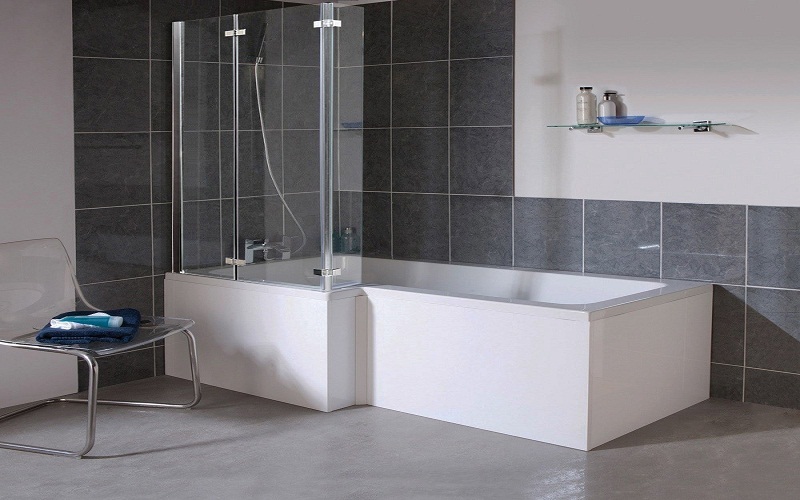 By having a bathroom of large dimensions you can install dark tiles to cover the walls and floors. If your bathroom is smaller we recommend that you opt for lighter colors since it will look like the bathroom is bigger. In this last option the great protagonist is the hydromassage shower . A real pleasure that we could not miss. If we have time to enjoy this type of showers, without a doubt they are a highly recommended option although you should also take into account that they are not economical. Also in this bathroom a division of spaces has been created by installing a transparent panel. In this way, the toilet area is separated from the bathroom area. With regard to the materials in this case , wood has been installed on the wall and thus a more welcoming aspect is achieved. If we opt for this option we must ensure the type of wood that we put since wood and humidity are not good friends. They are not incompatible, nor do they exclude each other , but the truth is that they can not always coexist in a single bathroom. If you are one of the lucky ones that do not have to choose, congratulations! But if you are in a dilemma between shower or bath, we will put the things clear to facilitate the decision.